My Grandmother had a saying which I grew very fond of. Like vacations for example. We count the months, weeks, days before an eagerly awaited journey. Well, while you’re waiting why not put the time to good use? During the months before our first highly anticipated trip to Italy my husband and I made many, many trips to the local bookstore. I was interested in books on learning the Italian language, while Frank was on a quest to find the very best city maps of Rome. I purchased many books and dictionaries on learning Italian, and even downloaded some lessons to listen to while driving or at work. However he was the official navigator on our journey so I let him revel in all the maps he wanted. After all this time, his most favorite map is a foldable street map of Rome made of very thin plastic. You could hardly tell it wasn’t paper, but it was so much more durable. This map refused to crumple or tear, stain or get soggy. It stayed in such good shape that we even loaned it to our friends for their trip to Rome. After three trips abroad it returned home pristine, crisp, without a mark, ready to go again and still as good as new. Wish I could say the same about me! Photo above is the latest in carry on luggage for all your knitting needs. Portable, light, and decorated with an Evil Dalek from the epic BBC television series, Doctor Who. 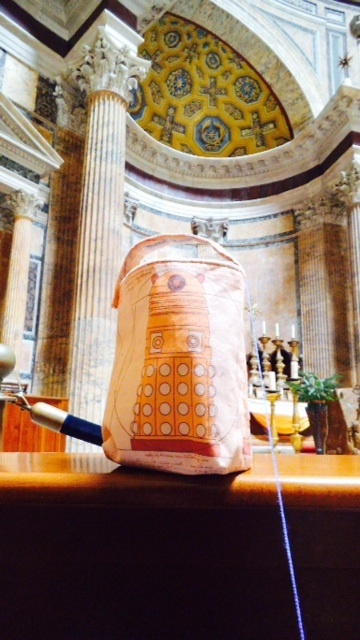 Easily travels to help you take your extreme knitting everywhere you go… Even the Pantheon!